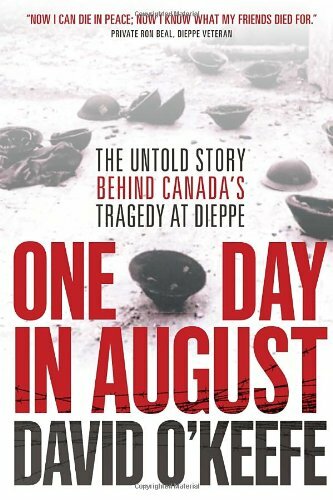 Magnificent and engrossing, One Day in August reveals in full for the first time the “Ultra Secret” story behind one of WW2’s most controversial mysteries—and one of Canada’s most sorrowful moments. In a narrative as powerful and moving as it is authoritative, David O’Keefe rewrites history, connecting Canada’s tragedy at Dieppe with an extraordinary and colourful cast of characters—from the young Commander Ian Fleming, later to become the creator of the James Bond novels, and his team of crack commandos to the code-breaking scientists of Bletchley Park (the closely guarded heart of Britain’s wartime Intelligence and code-breaking work) to those responsible for the planning and conduct of the Dieppe Raid—Admiral John Godfrey, Lord Louis Mountbatten, British Prime Minister Winston Churchill and others. The astonishing story critically changes what we thought we knew. Sergeant Gordon Davis of the 1st Canadian Parachute Battalion, riding a Welbike lightweight motorcycle used by airborne forces, Carter Barracks, Bulford, England, 5 January 1944.